Bring small pot of water to a boil and add garlic cloves. Boil for 15 seconds. Drain, peel, and cut off any brown parts. Cut the largest cloves in half lengthwise. On a sheet pan, toss the cauliflower with the garlic, 3 tablespoons of olive oil, 2 teaspoons salt, and 1 teaspoon pepper. Spread the mixture out in a single layer and roast for 20-25 minutes, tossing twice until cauliflower is tender and the garlic is lightly browned. 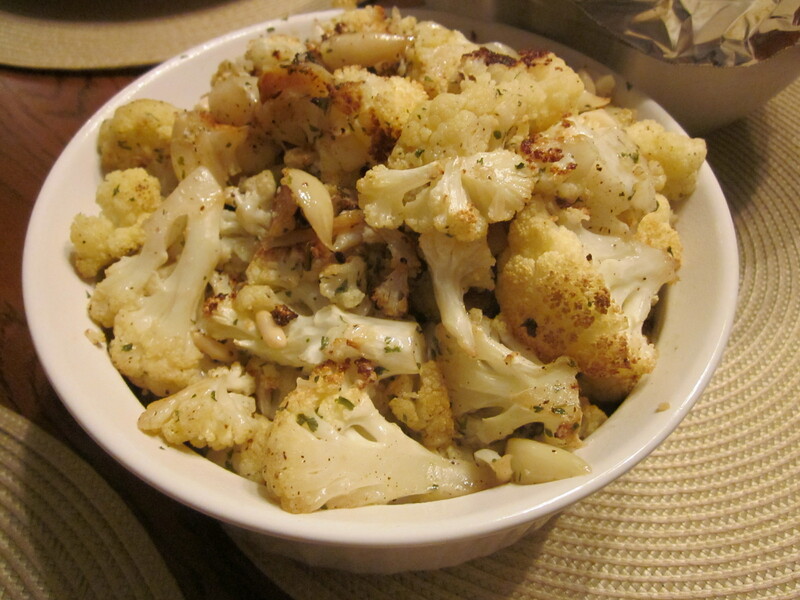 Scrape the cauliflower into a large bowl with the garlic and pan juices. Add the remaining 1 1/2 tablespoons olive oil, the parsley, pine nuts, and lemon juice. Sprinkle with another 1/2 teaspoon salt, toss well and serve hot or warm. It’s so good you will be picking the little bits off the pan and eating them while waiting for the rest of your meal to finish cooking lol! Enjoy!! I’m so behind with this blog it’s not even funny! I have a ton of recipes lined up… and now I have to search through my thousands of archives of pictures to find them!! This recipe for Spring Green Risotto was chosen as one of the May recipes by Kimberly from Indulge and Enjoy. I have to say I wasn’t thrilled with the idea of risotto… I had only had it once at a very nice restaurant in England… however it was so bland I had to dump practically an entire container of salt on it! I should have known better… because honestly at this point I think we all know Ina doesn’t make things that don’t taste good!! That said, I did have to modify this recipe a bit… while I’m sure that the mascarpone is delish… it had like an INSANE amount of calories and fat and since I was just cooking this for the 3 of us and not any guests I took the liberty of slimming it down. I’ve posted my modifications in green. And I just have to say that even with my hip slimming modifications this dish was amazing! Creamy, flavorful, and just yummy yummy!! 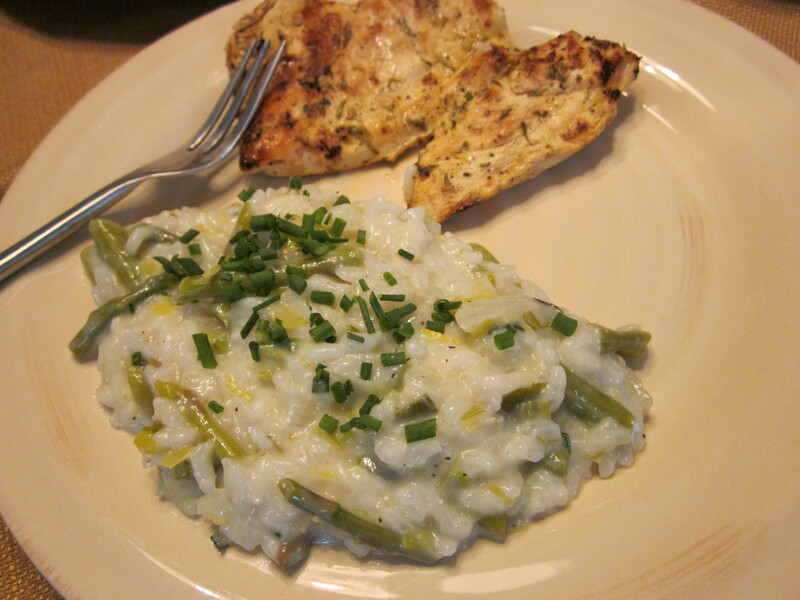 I made it with lemon garlic grilled chicken cutlets… it was fab!!! Enjoy!!! 4 to 5 cups simmering chicken stock, preferably homemade * I used the one in a box… I think it was College Inn?? 1/3 cup mascarpone cheese, preferably Italian * I used fat free cream cheese… it was delish! Heat the olive oil and butter (I used the 1 tablespoon olive oil and cooking spray) in a medium saucepan over medium heat. Add the leeks and fennel and saute for 5 to 7 minutes, until tender. Add the rice and stir for a minute to coat with the vegetables, oil, and butter. Add the white wine and simmer over low heat, stirring constantly, until most of the wine has been absorbed. Add the chicken stock, 2 ladles at a time, stirring almost constantly and waiting for the stock to be absorbed before adding more. This process should take 25 to 30 minutes. Meanwhile, cut the asparagus diagonally in 1 1/2-inch lengths and discard the tough ends. When the risotto has been cooking for 15 minutes, drain the asparagus and add it to the risotto with the peas (string beans), lemon zest, 2 teaspoons salt, and 1 teaspoon pepper. Continue cooking and adding stock, stirring almost constantly, until the rice is tender but still firm. Whisk the lemon juice and mascarpone (fat free cream cheese) together in a small bowl. When the risotto is done, turn off the heat and stir in the mascarpone (cheese) mixture plus the Parmesan cheese and chives. Set aside, off the heat, for a few minutes, sprinkle with salt and pepper, and serve hot with a sprinkling of chives and more Parmesan cheese. There is a special fondness for shrimp cocktail in my family… starting from as far back as I can remember…Basically every recipe is the same .. the only difference is the brand of cocktail sauce you used or how much ketchup you added to the chile sauce! So, when I saw Ina make this on her show one day I mentally filed it away because it amazed me how one simple step can transform such a plain jane dish! Also, her cocktail sauce is wicked spicy on it’s own so don’t be alarmed when you taste it without the shrimp. Add the shrimp and it works together perfectly!! 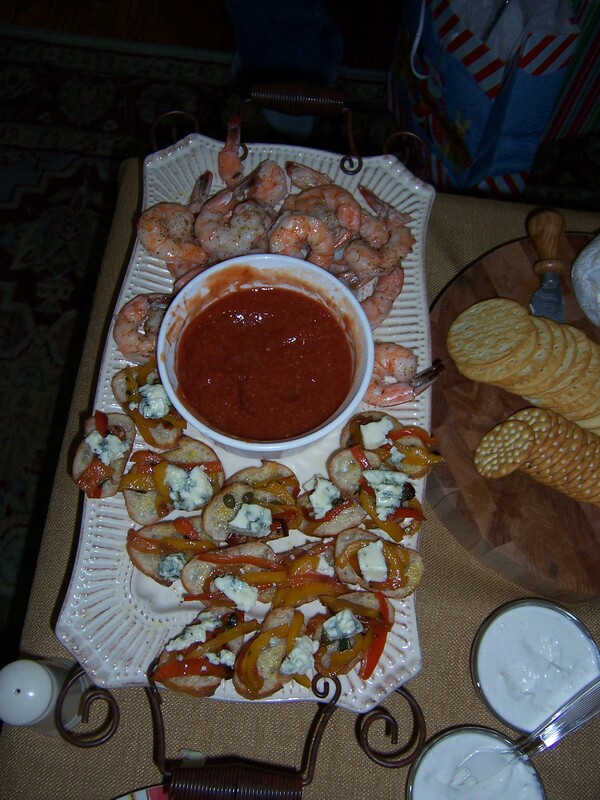 This picture shows the roasted shrimp cocktail and also Ina’s roasted pepper and gorgonzola bruchetta… I can’t remember if I blogged about it though… it’s awesome too….Enjoy! Roasted Shrimp Cocktail… I’m tired so here is the link! So, I have to confess… I am not a huge meatloaf lover. My hubby however, is a HUGE meatloaf fan! So every once in a while I break down and make it for him. Unfortunately for him, my meatloaf recipes are mostly like my meatball recipes… (see BB: Real Spaghetti & Meatballs for details). UNTIL NOW! Mwahahahaha! Once again, Ina has worked her magic. 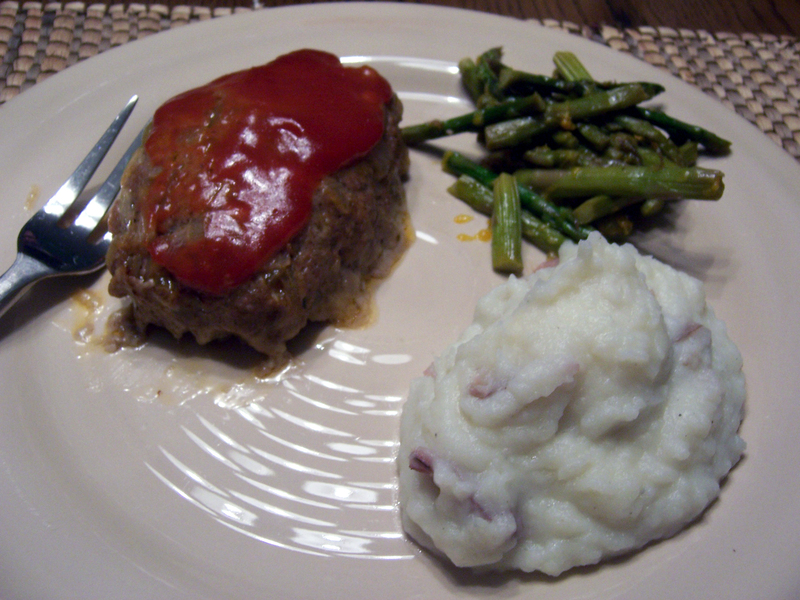 This meatloaf was simple and delicious and got thumbs up from all 3 of us! Try it and let me know what you think! Special thanks to Tonya of What’s On My Plate for choosing one of March’s Barefoot Bloggers recipe! Here is the link to the recipe as I currently have an almost 4 year old throwing stuffed animals up in the air behind me and don’t have time to type it out….the only change I really made was subbing the meatloaf mix for the chuck… you know.. the 3 little mounds in the butcher section… beef/pork/veal. Enjoy! However, once in a while I come across something veggy that sounds interesting. So the questions always are “Will it taste good?” and “Will it fill my husband up?” The answer for this recipe is YES!!! Preheat oven to 425°. Spray 2 baking sheets with nonstick cooking spray. In a large bowl, combine the broth and vinegar. Add the eggplant, tossing to coat. Arrange the eggplant slices on the baking sheet and bake for 15 minutes, or until soft. In a large saucepan, heat the oil until hot but not smoking over medium heat. Add the onion and garlic and cook, stirring frequently, until onion is softened, @ 7 minutes. Add the flour and cook, stirring constantly until light golden, @ 4 minutes. Gradually whisk in the milk and cook, whisking frequently, until the mixture is slightly thickened, @ 4 minutes longer. Spray a 9×9 inch baking dish with cooking spray. Line 2 sides of the dish with eggplant slices, leaving a 2 inch overhang. Spoon the orzo mixture over the eggplant, fold the eggplant ends over the mixture, and pour the tomato sauce on top. Bake for 20 minutes, or until moussaka is piping hot. Sprinkle remaining 2 tablespoons mozzarella on top and bake 2 minutes longer or until cheese is melted. Shame on me… I had the pleasure of choosing one of February’s recipes and I am soooo far behind! In my defense, I did have an oven incident which returned me to being “Queen of Microwave Cooking” for about 2 weeks….. more on that later when I post about Indonesian Chicken. 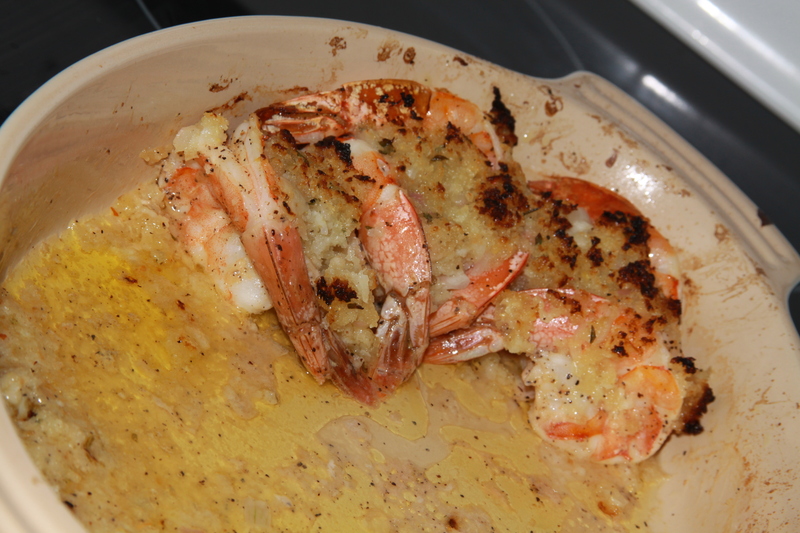 So what to say about this Baked Shrimp Scampi recipe except that it’s freaking awesome!! I’ve actually made it twice now, and will be making it again tonight. It is so easy to make and tastes so absolutely delish! Shrimp scampi has always been one of my family’s favorite meals ever since I was a kid! My dad had some creative ways to making it (including a microwave version which sounds gross but is actually really yummy!) This is by far the best one I’ve come across, and it’s better than in the restaurants because you can choose to use the monster size shrimp and not be limited to just 4-5 measly little ones on your plate for $25+. I served this a few different ways, once with rice and once over egg noodles. Both times, I made broccoli as a side dish. Just steaming it worked well because you can then just toss it into the scampi sauce! A few changes I made to the recipe was that I didn’t use the wine and I omitted the egg yolk. Wine doesn’t seem to last long in our house and every time I go to make this recipe I never seem to have any lol! And… egg tends to skeeve me out, so if I don’t think it’s needed I skip it. I subbed lemon juice for the wine and it was great. Another time I didn’t have lemons, but I did have lime so I used lime for all the lemon and cilantro for the parsley… very yummy twist on the recipe! It was so good, even my almost 4 year old little chicky ate it! She’s becoming very adventuresome lately with her food choices even branching out to her new favorite “sushi”.. or as she pronounces it “soooshi”… more on that in a later post! We’ve all ordered them at one point or another… probably bought them from your local grocery in the familiar red and white package. However, making them from scratch (without freezer burn) was sooo yummy! I made them as part of a football lineup… it also included a magical recipe for chili made with beer (I’ve made it multiple times, and yet keep forgetting to take pictures of it). The recipe in the book was for a “healthier version”… but since I was making it for 8 guys watching football I did away with that… I’ve posted the original recipe and my ‘tweaks’ to make it unhealthier (if that’s a word). 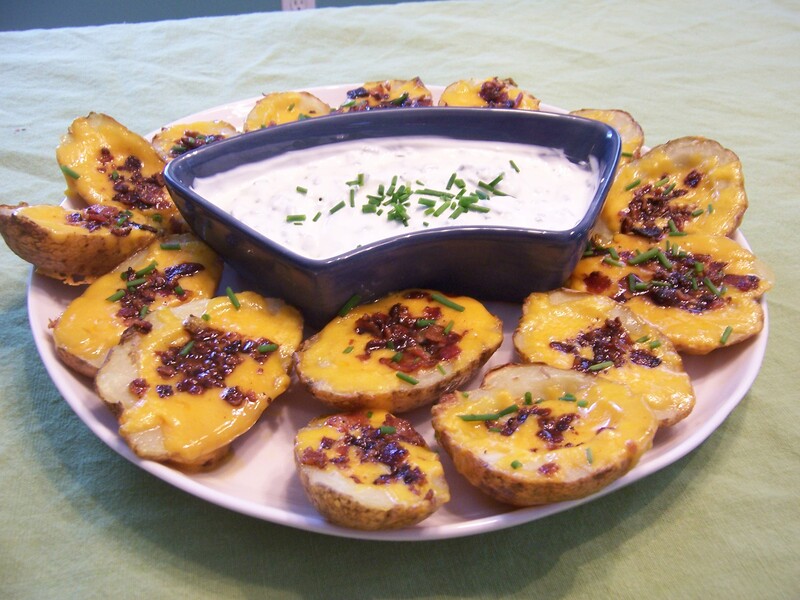 With a spoon, scoop some of the potato out of each skin being sure to leave @ 1/4″ of potato inside the skin. All Ina, all the time!